We recently heard of the death of one of our supporters, Maggie Jeens, who passed away on the 3rd November 2016. Maggie is pictured along with Buddy, a stray cat who turned up on her doorstep, who she rehomed herself. 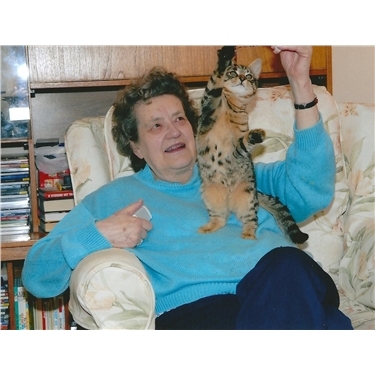 Maggie was a longtime lover of cats, as well as being very charity-minded, and she would take in strays and help friends with cat-sitting whenever she could. One of our volunteers, Roger, Smith, was a friend of Maggie's and his adopted cat, Fred, would go to stay with Maggie whenever Roger was away. Roger told us that all donations given in at Maggie's funeral would be for the benefit of Wolverhampton Cats Protection; we were sad to hear of Maggie's passing but so grateful to her and her family for their ongoing support to us. We were absolutely flabbergasted to discover when we collected the final amount from Roger that the total donations were for £500.86! We would like to extend our condolences along with thanks and very best wishes to Maggie's friends and family including her daughter Mrs Astbury. We would also like to thank all of Maggie's friends and family who gave so generously to our cause in her name. Maggie's legacy means numerous cats and kittens will benefit from from her ongoing support, something we will always remember.